Are you as uncomfortable as I am? 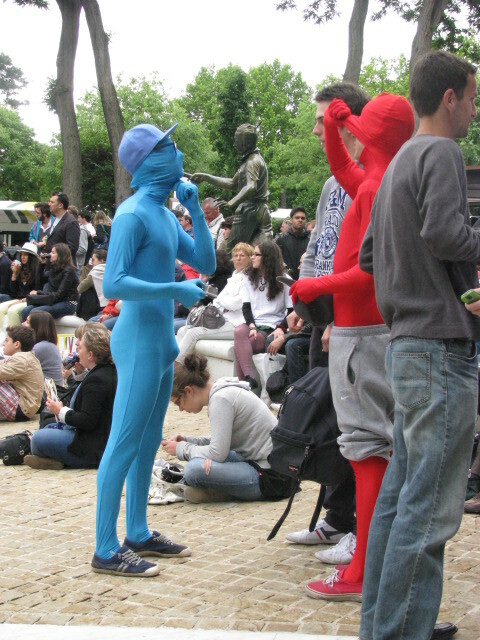 Two fans at the French Open in 2012. This entry was posted in Travel Photos and tagged 50 Year Project, France, French Open, Humor, Life, Paris, Photography, Roland Garros, Sports, Sports Fans, Tennis, Tennis Fans, Travel, Travel Blog, Travel Journal, Travel Photo. Bookmark the permalink. looks like those gray sweatpants were a good idea even if they break up that color statement. lol. i understand the desire to stick with the fashion plan, but…. Yes, the sweatpants are needed, for obviously reasons. And it was cold that day! I think Emile took one look at his friends and sobered up. I agree…I didn’t want to know everything about him before I had a chance to say hello. He feels no shame, I think, as his face is covered and no-one will recognise him. I do find his attire a bit indecent. LOL Some fans really get into their sports. I love sports, but so far I’ve resisted wearing one of these. In the winter they might be good under clothes to stay warm. LOL!!!! Ok, I might regret saying this, but I just can’t resist. I am sooooo bad!! All I can say is that I’m so glad that girl sitting on the ground did not raise her head when you took that shot. That would have looked really bad :). Ha ha ha. Too funny. A lot of kids wore the morph suits for Halloween last year – they come in so many variations. I seem to see them mostly at sporting events. Halloween isn’t that big here in London. Speechless…, and a good laugh! funny. reminds me of something but too early for the thought to surface.